^ Quickfacts.census.gov - Erie County - accessed 2011-12-06. ^ Quickfacts.census.gov - Buffalo, New York - accessed 2011-12-06. ^ Smyczynski, Christine A. (2005). 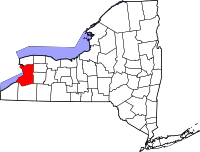 “Southern Erie County - "The Southtowns"”. Western New York: From Niagara Falls and Southern Ontario to the Western Edge of the Finger Lakes. The Countryman Press. p. 136. ISBN 0-88150-655-9.